Meng Ding Mountain in southwestern China is famous not only as the hometown of panda bears but also as where tea was first cultivated at Gan Lu Si (Sweet Dew Temple). This tea was cultivated at this Taoist temple over two thousand years ago, hence the name Gan Lu (Sweet Dew). Meng Ding Mountain in southwestern China is famous not only as the hometown of panda bears but also as where tea was first cultivated at Gan Lu Si (Sweet Dew Temple). This tea was cultivated at this Taoist temple over two thousand years ago, hence the name Gan Lu (Sweet Dew). It has been a tribute tea since the Tang Dynasty. About 1,200 years ago, Monks would report to the local government, to alert the officers it was time to make tea. Five days before the processing would begin, the government officer would live in the temple for five days, eating vegetarian and bathing thoroughly to cleanse his body before touching the treasure from the gods. On the morning of picking, they would set off fire crackers in the field to “wake up” the tea. Now, there are about 20,000 workers who are involved in processing this tea each year. Around March, the picking season begins. During the early morning of The buds are picked very early in the morning while it is still very chilly and still dew remaining on the grass. This certified organic tea uses mostly tender tea buds, which are then carefully curled during processing. While the tea buds are very tiny, the unique character of the tea bush creates a bright green tea color, fresh rich flavor and highly nutritious tea, even while using a small quantity of tea. Enjoy the sweet chestnut aroma and lingering sweet aftertaste of Sweet Dew. Sweet Dew is named after this Sweet Dew Temple "Guan Lu Si"
Sweet dew temple"Gan Lu Si"
This region is famous for giant panda breeding. 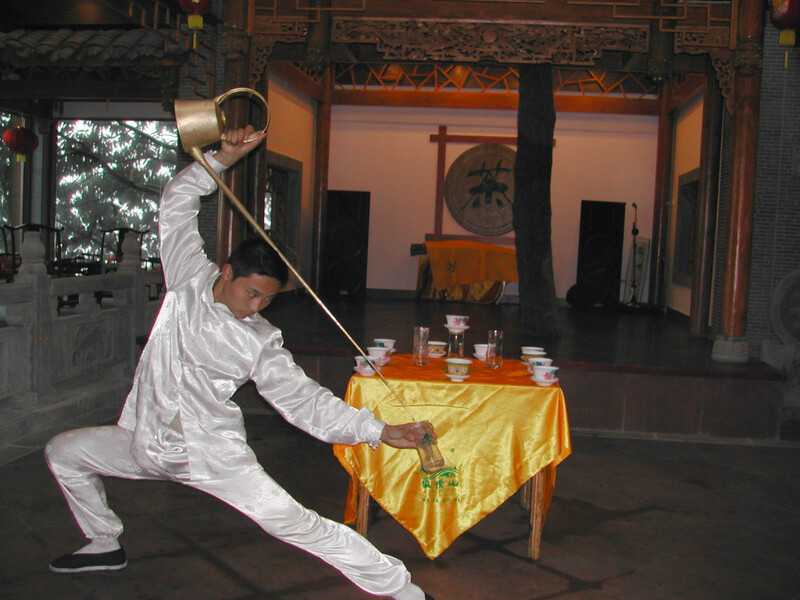 Tea culture started in Sichuan Province, where Sweet Dew is made. Sculpture of Wu Li Zhen in Sichuan Province. He is the first human being to plant tea here 2200 years ago. Tea snacks in a Tea House in Sichuan Province.